But back to reflecting on my time as a Sea Grant Scholar. This was an experience that I enjoyed thoroughly. It has been a goal of mine for quite sometime to get an internship at an agency like the EPA, and I have enjoyed every minute of it. Even the countless minutes spent in a dark room extracting and analyzing chlorophyll. I’d like to thank Sea Grant and my mentors for making this happen for me. You guys are the best; it has been a pleasure working with people who are so knowledgeable and enthusiastic about marine science. After eight practically non stop grueling weeks of collecting and analyzing, the phytoplankton limitation experiment has largely been completed. Wow. I can’t believe I am saying that myself. We have completed the in vivo portions of phytoplankton limitation experiments from Yaquina, Siuslaw, Umpqua, Nehalem, and Alsea. And we did Yaquina three times. Just saying. The most recently completed experiment from both Alsea and Nehalem responded well. Alsea showed “N” limitation which I believe I predicted last week, and Nehalem showed a combination of “N” and “P” limitation which I believe I also predicted last week. Not to toot my own horn or anything. Just because we finished the in vivo doesn’t mean there isn’t work to do though. I have some chlorophyll samples to extract from Alsea and Nehalem, some acid washing to do to get the bottles all neatly put away for another day, some data to analyze, and a presentation to create that will knock the socks off of everyone at the symposium. And because the symposium is rapidly approaching, I won’t say too much more about how my eight weeks of data is looking. Wouldn’t want to ruin the surprise! Alright, until next time! Each week it get’s harder and harder to piece together the whirlwind that was my life in the past seven days, but here I am again to give it another shot. From what I recall, I seem to remember spending a significant amount of time with 2 liter bottles. Yes, that sounds about right. Which estuary were these bottles from though? Yaquina? Nehalem? Alsea? Umpqua? Siuslaw? A combination of the above? And what kinds of responses did they show again? Digging deeper, I can confirm with 99.99% confidence that we conducted a phytoplankton limitation experiment with water collected from the Siuslaw estuary. While, I haven’t extracted and analyzed the chlorophyll from these samples yet, the in-vivo results seem to suggest that this particular estuary was both nitrogen and phosphorus limited in different locations. Given that the alder cover in this particular estuary was about 7.4%, compared to the largely “P” limited Yaquina which has 13.4% alder cover, this is an interesting result. Remember, alders are tremendous nitrogen fixers, and are huge source of the nitrogen that eventually ends up in these bodies of water. Looking forward to this week, we have samples from both the Nehalem system up north, and the Alsea system in Waldport. These systems have 5.15% and 7.9% alder cover respectively, so I would expect to see similar results, if not outright “N” limitation. Alright, now to take a little step back from the data. This week will be week eight, and after this week we will have conducted a staggering six phytoplankton limitation experiments from the estuaries I listed above. Those two weeks we missed were my first week on the job, and the Fourth of July week. Other than that, I have helped conduct an experiment each week I have been here. It has been a tremendous experience, and I can’t even fathom how much I have grown as an aspiring scientist. I have also grown more and more intrigued by the field of Marine Pollution and Water Quality. It is an area of marine science which I am going to spend a considerable time investigating once I finish up this internship, and begin to contemplate graduate school programs. Alright, that’ll do it for this week. Until next time! This past week was another busy one, and one in which a mystery was solved! I know you were all dying to know how the great chlorophyll mystery would turn out. Well, the verdict is in, and the chlorophyll was not degrading. It was instead being trapped underneath the filter paper in the bottom of the centrifuge tubes. With this problem solved we collected higher quality data, but data that still had some variability in it. We might have to work on this a little more, but it was good to at least identify the major problem, and confirm that we were largely seeing “P” limitation in Yaquina Bay. We probably weren’t noticing our little problem in the first run through of the experiment, because working with chlorophyll often means that you are working in the dark. Which brings us to the theme of this week’s post! Science after dark! Sounds scandalous, but I assure you the discussion that follows is family friendly in its entirety. Towards the end of the weekend, and our rendezvous in Corvallis to discuss our internships and set up Sea Grant’s DaVinci Days booth, I got a call from my supervisors asking if I was available on Sunday night to collect the samples for the coming week’s experiment. I of course replied in the affirmative, and we met up at the EPA at about 8:30 PM. We finished at about midnight, and needless to say we were pretty tired. It was a fun, if not tiring, little twist to our summer experiment though. Working in the field at night, much like in a dark lab, presents some unique challenges when trying to do science. Mainly, how to juggle your flash light with all of your equipment and notebooks. Which is to say, I should probably invest in a headlamp. Hopefully, with our earlier collection to start the week, our results will be a little clearer by the time Friday morning rolls around. Something tells me they won’t be though, but everyone keep their fingers crossed! Think positive thoughts. Encourage the phytoplankton from Elk City, Oregon to respond earnestly to our nutrient spikes. That’s all for this week! Until next time! Ahhh another week, another experiment! The joys of science! This past week we again collected water from our same four sites throughout the estuary. Having mastered, or at least improved, our procedures and techniques for the experiment we were looking to clarify some of the results from our first run through. As you may or may not recall, our first week suggested that the OSU had a significant response to the “+N” and “N+P” treatments, suggesting nitrogen limitation. While the sites further upstream tended to show “P” limitation, with Elk City showing some variability. These are all results we were looking to clarify. Would OSU still be nitrogen limited? Or had we sampled during a period of weak upwelling? Would Elk City and the sites up river have a clearer response? As we progressed through the week, and hadn’t had many answers to these questions, we began to grow a little nervous. 3-4 days of results from the mesocosms weren’t providing many answers. This seems to be how these nutrient limitation experiments go, as often times there are fews signs that point to limitation, and then all of a sudden a huge response. This is difficult to account for as the week comes to a close, and the difficult decision of whether working on a weekend will produce results needs to made, as it could be that no response is the actual result. This week we decided to go for it and see if Saturday would give us the breakthrough we were hoping for. It turned out that Saturday was largely a success. We determined that there was in fact a significant “P” and “N+P” at Elk City. Cannon Quarry showed similar results, but with more variability in the “N+P” treatments. Toledo also showed significant responses for these two treatments. As for OSU? Less clarity than had been hoped for. The week’s data trends point to “P” limitation as opposed to the “N” limitation that initially occurred, perhaps indicating stronger summer upwelling. However, there is fairly large variability in the “P” and “N+P” treatments, meaning the statistics are throwing a wrench in our quest for results! There may be bright spot though, as our chlorophyll extractions could provide clearer, more accurate results. This is a big maybe though. We seemed to have some problems with severe degradation in our samples during the first run through, so hopefully those problems magically disappeared! We were quite puzzled as to how it could have happened. And so with that sense of bewilderment fresh in your mind, I will again leave you in suspense! Tune in next week for the results of the chlorophyll extractions! Will the mysterious source of degradation strike again? Or will the chlorophyll respond to my careful, sweet nurturing? Until then! Good night and good luck! Well first of all, happy belated Fourth of July! This past week I spent time further analyzing the data from the first run through of the experiment, while also doing all the preparation necessary to start it up again. Interestingly, a test used to more accurately measure chlorophyll (a different test from the initial results) showed less confidence in our data set. As a consequence we have decided to add another replicate to each treatment. 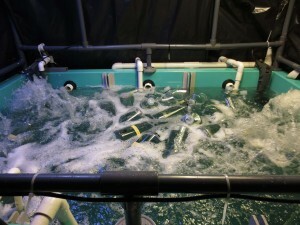 For those keeping track at home, the math now changes to 4 x 4 x4 or 64 bottles floating around in our little mesocosms. I won’t bore you with the details, but this significantly adds to the work involved in running the experiment. I promised last week to discuss the consequences of nutrient limitations in estuaries, so lets delve into that a bit. Nutrient limitations of phytoplankton are an interesting topic of discussion. You may have heard about two relatively popular topics in the media related to these ideas. These are iron fertilization and the dreaded “dead zones.” These topics show the potential benefits of understanding nutrient limitation, and also the potential for havoc. They are two sides of the same coin. Iron fertilization seeks to enhance phytoplankton blooms in an under productive area of the ocean in an attempt to remove carbon dioxide levels in the atmosphere. In these areas, iron is largely seen as the limiting nutrient. “Dead zones” in contrast to the less productive open ocean, usually occur in the productive areas and result in eutrophication. Eutrophication is the direct result of an abundance of the nutrients in a system. These nutrients may come from natural processes like upwelling events and nitrogen fixers, but also from human wastes. These nutrients, in contrast with the iron limited open ocean, are largely nitrogen and phosphorous. Eutrophication decreases the available dissolved oxygen in the water as an abundance of phytoplankton bloom and ultimately die like all life on earth. This decrease in available oxygen is the reason for the term “dead zone.” As you can imagine, a decrease in available oxygen is undesirable for marine ecosystems. So what does all this mean for Oregon’s estuaries? Well, if out of our 64 bottles a treatment shows a significant response for say phosphorous or “P”, we know that region is phosphorous limited. For an agency like the EPA, this directly translates into tools for management and policy. My advisor is working on tools for scientists from states throughout the country to be able to identify conditions in which nutrient limitations may be a factor. Regulations may also be crafted to prevent phosphorous wastes in fertilizers and other sources from polluting aquatic systems and ultimately harming species by depleting the available oxygen. And so, while I spend my hours of the day pulling bottles out of a tank and doing science on them, I can take pride in knowing that yes, this matters. Alrighty, that’s all for this week. Stay tuned for next week in which I may have some more results from the experiment! Here’s hoping for clarity! The Mesocosm or "Tank 1"
Monday arrived this past week, and with it came the dawn of the project I will be working on this summer. I collected 35 liters of water from 4 sites throughout Yaquina Bay. One of the sites, “OSU Dock” as the EPA calls it, is right outside the Hatfield Marine Science Center Visitor’s Center. The other sites are further up river around the city of Toledo, with one site being labeled as “Toledo” and the other sites “Cannon Quarry” and “Elk City.” So why on earth am I collecting 35 liters of water and lugging it back to the EPA labs? Excellent question. Let me explain. The purpose of collecting these 140 liters of water combined is to examine the nutrient limitations of phytoplankton throughout the estuary. After these samples were collected, we divided them up into 48 two liter bottles. We measured the initial nutrient concentrations as well as the chlorophyll a concentrations, and then proceeded to “spike” them. Along with a control of plain water, these spikes consisted of treatments in which a Nitrogen spike, or “N”, was added as well as Phosphorous, or “P” spike. To further confirm whether a given spike had an effect an “N+P” spike was also a treatment. The result is 3 replicates of each treatment for each site, or 3 x 4 x 4, totaling 48 bottles. Complicated, I know, and they proved to be a little difficult to manage as the experiment progressed. Once these bottles were spiked according to the given treatment, they were randomly placed in a mesocosm or in this case two tanks with pumped sea water and UV lights. These tanks produce the environmental conditions found throughout the estuary, so they are quite useful in conducting experiments. They were placed in these tanks starting Monday night, and there they remained till Friday morning. Every day, I measured the temperature of the water in the tanks, and the photosynthetically active radiation (PAR). More interestingly though, I also measured the relative fluorescence of each bottle, to get a sense of whether any given spike was having an effect. The result? The OSU Dock, or the site closest to the ocean, had a significant response for the “+N” and “N+P” treatments, suggesting that there wasn’t very strong upwelling prior to the sampling resulting in Nitrogen limitation. This may change as the summer progresses. The results further up river suggested “P” limitation, as the Toledo and Cannon Quarry sites showed significant results for the “+P” and “N+P” treatments. Elk City showed a significant response for the “+P” treatments, but mixed results for the “N+P” treatments. We believe that if given more time, the “N+P” treatments might further reflect the results from other sites. We will replicate this experiment several more times of the course of the summer so we will see how the results change as summer progresses. Regardless, from this week of the experiment it is evident that further up river phytoplankton appears to be limited by phosphorous concentrations. Keeping with my themes of leaving you hanging, I’ll get more into what this means next week! But I will say that I really enjoyed this week. Performing science at a high level, with the means and ability to conduct an experiment in a week is amazing, and I consider myself to be very, very lucky. Furthermore, it is a terrific feeling to know that the science you are doing is extremely pertinent to the state and the country in which I have largely spent my entire life. Alright, before I get too sentimental, I will say goodbye and remind you to look for next week’s post to learn more about what the results of my summer experiment mean for Oregon’s estuaries! Wow, what a week! After Thursday and Friday finals, moving out and cleaning out Saturday, and a Sunday afternoon graduation featuring First Lady Michelle Obama, Monday arrived with orientation with Sea Grant and the PCEB of the EPA at HMSC! That would be the Pacific Coastal Ecology Branch of the Environmental Protection Agency, located at the Hatfield Marine Science Center, and yes, this is only the beginning of the dizzying array of acronyms I would encounter this week. In turns out, working for the federal government involves some fairly extensive training. The EPA requires employees to undergo 24 hours of Safety, Health and Environmental Management training (SHEM). Once those 24 hours were completed, I was able to move on to the science paperwork and the Standard Operating Procedures (SOPs)! Believe me, while not sounding incredibly interesting, these documents were a relief from the SHEM training. It was in these documents that I was able to see a glimpse of the future science I would be performing. Despite the endless amounts of paperwork that came through my door and unto my desk Tuesday, Wednesday, and into Thursday, I remained incredibly excited about the opportunity that I had received, and that excitement was rewarded on Friday. On Friday I got my first taste of fieldwork with the EPA. We took the boat out with our personal flotation devices (PFDs) securely fastened and collected samples showing the effects of different nutrient solutions on the growth of periphyton. While this project was not the one I will be working on, it was an important opportunity to get familiar with some of the procedures and equipment that I will be using in my own project. My project will examine nutrient limitations on phytoplankton, and it begins next week! So stay tuned for next week’s post where I will have exciting descriptions of my experimental design, and hopefully some super cool pictures of my laboratory work! Believe me, this lab is neat. Think mesocosm. I have said too much! See you next week!